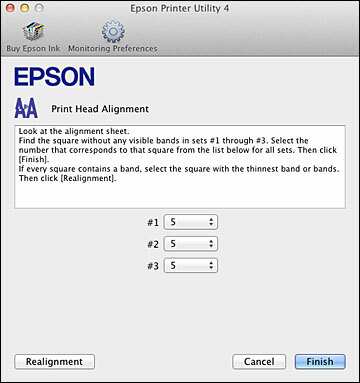 You can align the print head using a utility on your Windows computer or Mac. Make sure that no product lights indicate errors, the CD/DVD tray is not inserted in the product, and the CD/DVD feed tray is closed. Load a few sheets of plain paper in the product. Windows: Right-click the product icon in the Windows taskbar. Mac OS X 10.6/10.7: In the Apple menu or the Dock, select System Preferences. Select Print & Fax or Print & Scan, select your product, and select Options & Supplies. Select Utility and select Open Printer Utility. Mac OS X 10.4/10.5: In the Apple menu or the Dock, select System Preferences. Select Print & Fax, select your product, and select Open Print Queue or Print Queue. Select Utility. 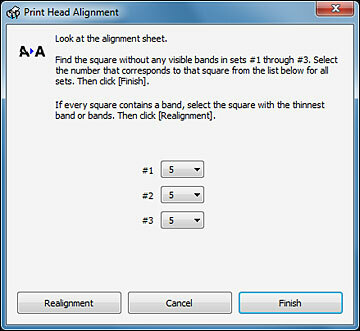 Click Next, then click Print to print an alignment sheet. Note: Do not cancel printing while you are printing a head alignment pattern. Check the printed pattern and follow the instructions on the screen to choose the number representing the best printed pattern for each set. When you are done choosing each pattern number, click Finish. If no patterns are aligned in one or more of the sets, choose the closest one in each set and click Realignment. Then print another alignment sheet and check it.